Did you know that 20 percent of all searches on the Internet are for specific locations or businesses? Search giant Google did, and that’s why they changed Google Local to Google Places and began to display – for every search query that may be locally or geographically influenced – the local information for businesses, maps, and directions in the search engine results pages (SERPs). Right now, Google displays seven Places results for every search, as well as a map on the right side of the SERP that shows exactly where these seven places are. Obviously, Google Places pages help customers search these maps for local information while finding businesses within their area that are relevant to their search. Meanwhile, for small businesses, mom-and-pops, stores, offices, and other organizations with a physical address, Google Places is a unique local search tool that can drive and direct those who are searching to those who have something to offer or sell. Leverage this tool like a pro and increase the visibility of your Google Places page in relevant search results. Want to appear in the Magic Seven for each search query that applies to you? Looking to literally put your business on the map of Google’s search engine results page? Here’s a list of great tips that are guaranteed to put you in the best possible position. Keyword research: Just like in traditional SEO practices, keyword research plays a huge role in getting search engines to give your business some love. Don’t trust your gut, though; there are plenty of free keyword research tools out there that should take the guesswork out of what people are typing when they search. 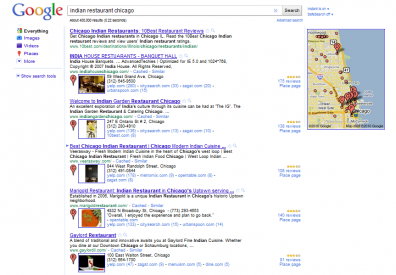 When using these tools and looking up new keyword variations, always remember to include local information (like your city or state, as in “Indian restaurant Chicago” or “Illinois bookstore”). Claim your page: Thanks to the loads of information from online directories, maps, social networks, local search engines, websites, and blogs, Google has the ability to automatically create a Places page or listing for your business. If this happens, claim ownership of that page as soon as you can. (After all, you cannot win the lottery without a lottery ticket!) Only then will you be able to manage the information it contains, as well as how it appears on search results. Fill in your Places page with correct, consistent information: This means entering your official business name, your official address, phone number, website URL, operating hours, and even the year you opened or the number of parking slots available. Make sure that this information is consistent across all other sites and networks (like your blog, Facebook page, LinkedIn and Twitter profiles), and not just on your Google Places page. Add a few more targeted keywords to your business description, but avoid keyword-stuffing at all costs. Write the description out naturally while avoid hard-sell tactics and marketing buzzwords. When selecting categories to describe your business, choose at least one of Google’s default options. Always update your page whenever you change address, domain names, E-mail addresses, or telephone numbers. Don’t create multiple Google Places pages with the same information. That’s the fastest way to confuse the search engine robots as well as the humans / potential customers. If it’s a different business, it should have a different set of local information. Add photos and videos: You’ll notice that Google Places allows page owners to post more than just text-based info; photos and videos are welcome, too. So add pictures of your dazzling storefront or close-ups of your mouth-watering starters. Upload your latest video, too, be it a corporate presentation or your last viral commercial. The more complete your page is, the more likely it is that your business will appear on the results page when people search for it. Not only that; potential customers will also appreciate your transparency and effort. Promote your promos: Do you have a coupon campaign? Do you regularly come up with special deals, discounts, and promotions for your business? List them, too, in the space provided; you can also upload posters to enhance the visual appeal of your Google Places page. Extend your local marketing efforts off-page: Google uses other online references to collate information about your business. So be sure to manage other sites over which you have control: your website and blog, social networking profiles, and local search engines, business listings, and directories like Yelp, City Search, Superpages, YP, and GPS navigation portals like OnStar. Customize landing pages for Google Places visitors: Users who click on your listing after typing certain keywords – “school supplies Illinois” or “cheap laptops Chicago” – will want to find what they’re looking for as soon as possible. That’s why it’s a smart move to spare them the struggle – by creating customized landing pages that contain information relevant to what they just searched. After all, directing these users to your home page after they click a link on your Google Places page might only turn them off. Encourage reviews: Reviews from other websites – whether positive or negative – add relevance and authority to your business and your Google Places page. While it’s no good to fake these testimonials (Google is an omniscient entity! ), you’ll do well to ask your most loyal customers to write good things about you. If no one’s biting, give incentives or hand out special deals that will motivate them to post their reviews. Thank you! I’ve been having trouble lately with managing my page (what with all the social media stuff going on too) but this is just what I was looking for. I totally agree with the point about customizing landing pages. If they click, that’s the bait that you should use as leverage for better chances at conversion. 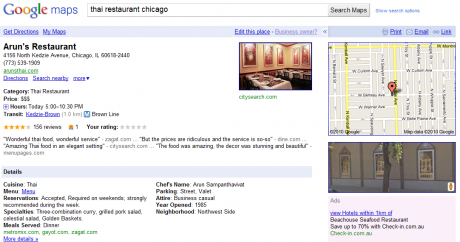 Excellent resource on Google Places which seems to be besting my organic search results. If you market on the internet, you better learn about this. Thanks for the tips! I’ll be changing my place page immediately. I like the ‘promote your promos’ part. Thank you! Hi i never realised that google did not like non geographic numbers so thank you! Really nice article Thank you!